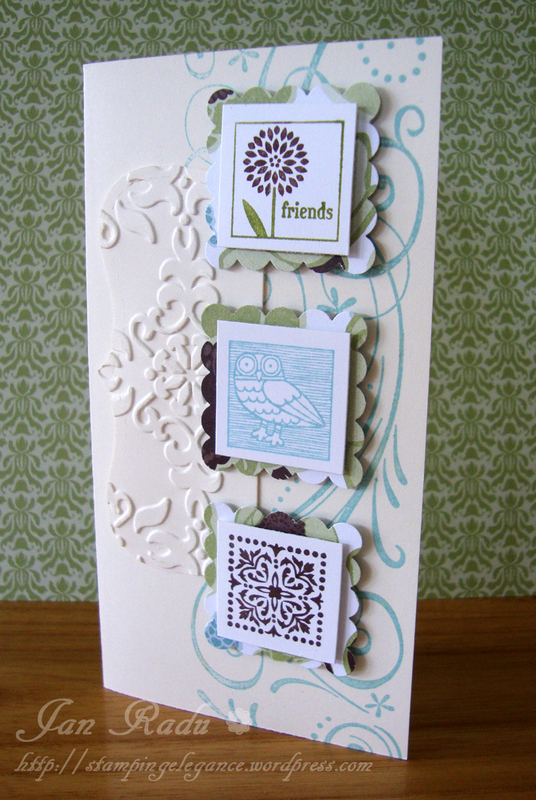 Time to share a few more projects created with new products from the Stampin’ Up! 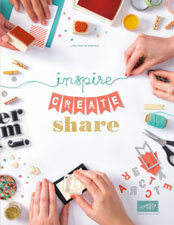 Idea Book & Catalogue 2010-2011. How deliciously summery is this colour combo? 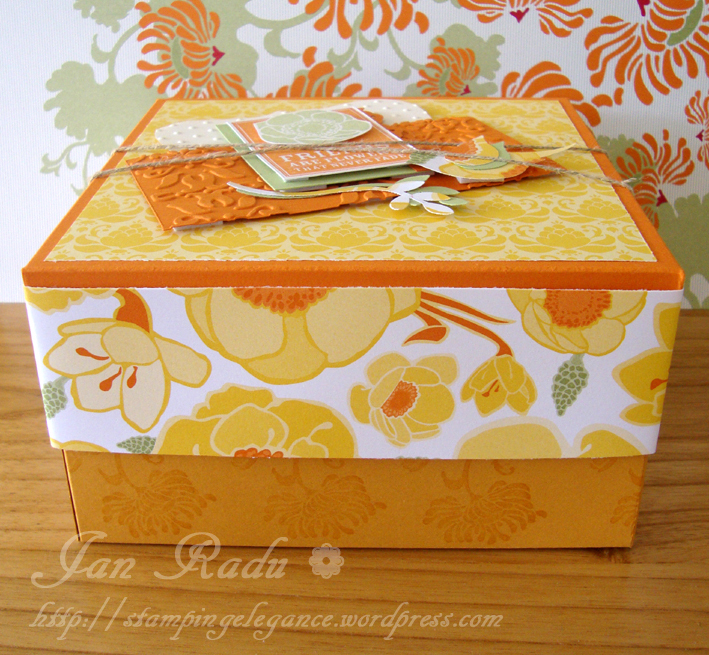 Pumpkin Pie the gorgeous new Daffodil Delight and Pear Pizazz. The Very Vanilla highlights just finish it off. 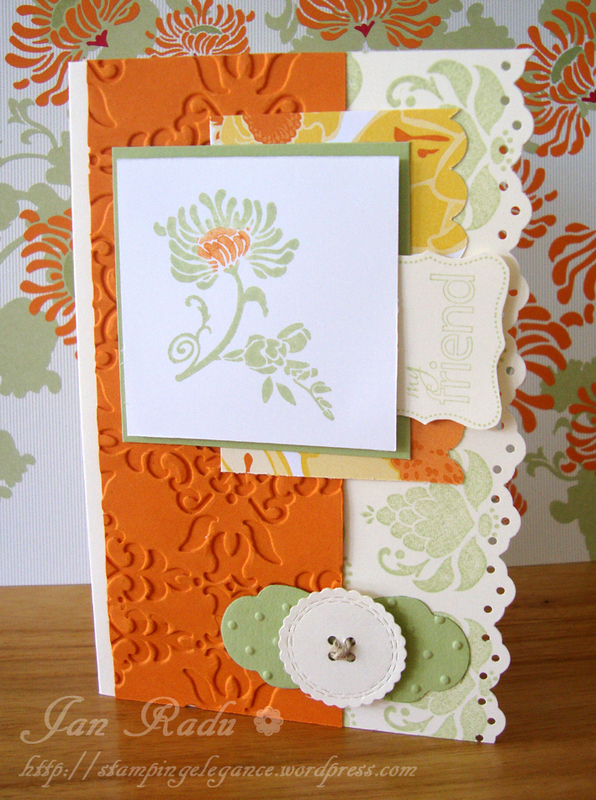 The stamp set is Friends Never Fade which is so versatile! I love every single image from the set. 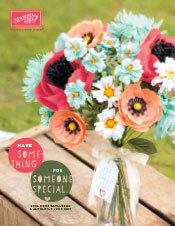 I also love combining the embossing folders Perfect polkadots and Vintage Wallpaper – the textures are fantastic! Baja Breeze, Early Espresso, Very Vanilla, Pear Pizazz – YUM! I’ve inked Early Espresso with my sponge onto the Vintage Wallpaper embossing and love the effect. 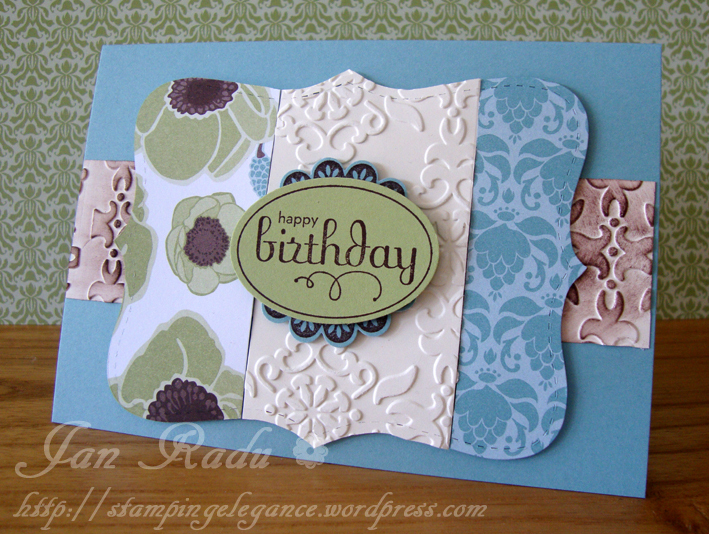 The Happy Birthday sentiment is from Perfect Punches – I love a stamp that matches a punch perfectly!!! Tucked underneath there is another stamp (matching the scallop punch) which has a Christmas sentiment on – I love how it frames the wide oval when layered like this. Did I mention that the delicious DSP I have used in all of these projects is from Greenhouse Gala? My adorable little gift bags have been stamped using the Hostess Level 3 Playful Pieces – I just lined the four rectangle stamps up on my large acrylic block, inked each up with a different stampin’ write marker and stamp all at once – cute eh? I added the handles with my stamp-a-majig to make sure it all lined up and then added a small heart with my punch using scraps of the DSP. My For Your stamp is from the Hostess level 2 Cute by the inch. Wow! Jan, these are all gorgeous. Love the Cute by the Inch one the best! You are in the zone, Jan! Oh my goodness. What a tonne of eye candy! Hey Jan! 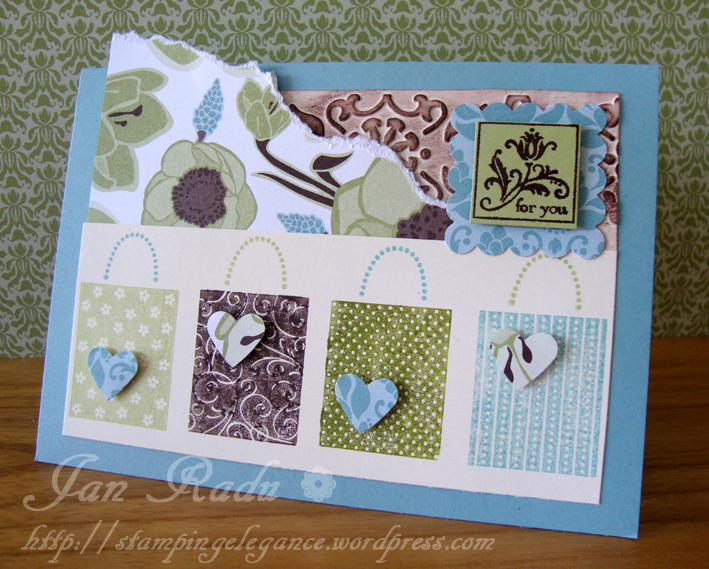 Stunning work all round – would love to know how you did the partial embossing on the last card – very clever. 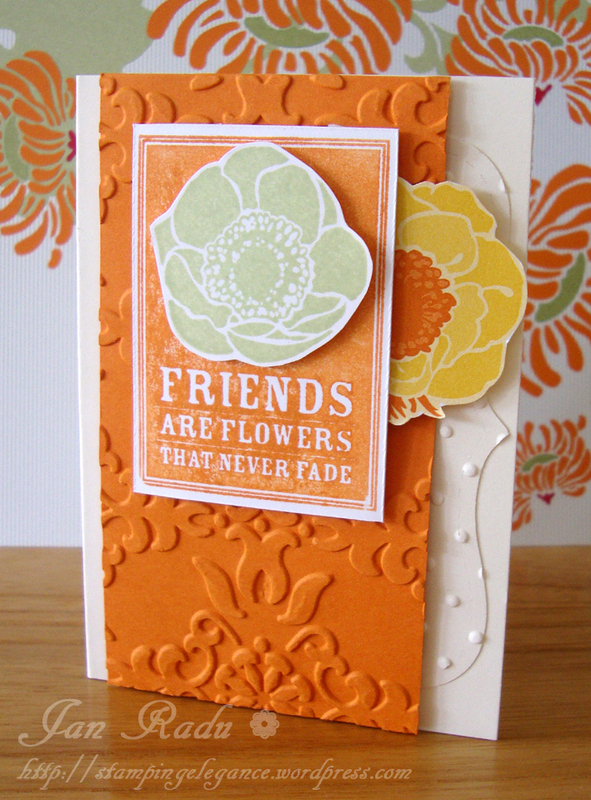 just a trick of the eye – half an embossed topnote in teh same colour as base card!